We offer the highest quality care at an affordable price. Our East Perth dental practice was opened in 1999 by Dr Judy Westerhout and her son, Dr Kieran James Chew. Dr Omelia Wan joined us just a few short years later. It is our mission to educate our patients on how to prevent common oral health problems and cooperate with them closely regarding their care. 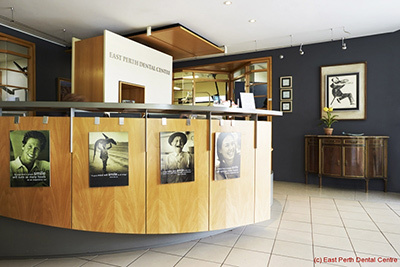 At East Perth Dental Centre, we offer the highest level of care without compromising quality. We do so in an affordable manner. The warm, friendly, supportive staff will work closely with you to determinate an appropriate plan of action for your long-term dental needs and goals. We want our staff to have a healthy work-life balance. After all, they’re just like family to us. We support each team member in his or her personal endeavours, including facilitating continued learning and training on the latest techniques and products. As we pass our knowledge on to you, our patient, you’ll enjoy trustworthy care that eases your mind. At East Perth Dental Centre, the team of dentists utilise only local Perth Technicians for all lab-made materials. Are You in Pain? Call Straightaway! Experience noninvasive, technologically advanced care that fits your budget. Contact our East Perth dentists today on (08) 9220 5555 to schedule a new patient appointment. Insurance plans are gladly accepted, plus we’re open late. Same-day dental treatment is also available!